The last Dreamworks animated movie was the dire Turbo (2013), a frustrating exercise in high concept animation that forgot very early on that it needed to be entertaining. With that in mind, and with How to Train Your Dragon 2 waiting in the wings, this update of two supporting characters from the Rocky and His Friends TV show that ran from 1959 to 1964 was likely to appear a bit of a gamble. 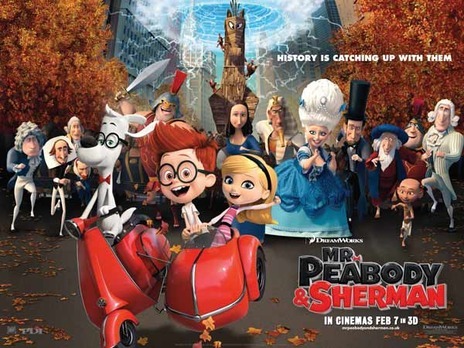 In recreating Mr. Peabody the dog (Burrell) and his adopted son, Sherman (Charles), writer Craig Wright and director Minkoff have fashioned a fairly straightforward tale and surrounded it with some great visual gags, and all the emotional heft a movie like this could ever wish for. After an extended prologue that introduces us to the WABAC machine – a device that allows Mr. Peabody to travel through time – and which finds the pair on a trip to the French Revolution (necessitating a daring escape from the clutches of Citizen Robespierre), Mr. Peabody reminds Sherman that the next day will see him go to school for the first time. His eagerness in History class earns the enmity of Penny Peterson (Winter), and during their lunch break she bullies him to the point where he retaliates and bites her. Enter Miss Grunion (Janney) from Child Services. She informs Mr. Peabody in no uncertain terms that if her investigation finds he is not a fit parent, then Sherman will be removed from his care. On the same evening Miss Grunion is due to visit, Mr. Peabody invites Penny and her parents (Colbert, Mann) over for dinner in an attempt to smooth things over. While he entertains the Petersons, Sherman finds himself tricked into showing Penny the WABAC. Penny ends up in Ancient Egypt where she is to be betrothed to King Tutankhamun; at first she’s intent on staying as she’s being treated like a princess. When she learns that if he dies, so will she, Penny changes her mind about staying and it’s up to Mr. Peabody and Sherman to rescue her. Getting back proves difficult and the trio end up visiting Leonardo da Vinci (Tucci) who is having problems painting a less than cooperative Mona Lisa (Bell). While Mr. Peabody repairs the WABAC, Sherman and Penny take da Vinci’s prototype aeroplane for a spin; here Sherman’s perceived recklessness causes the beginning of a rift between the titular pair. 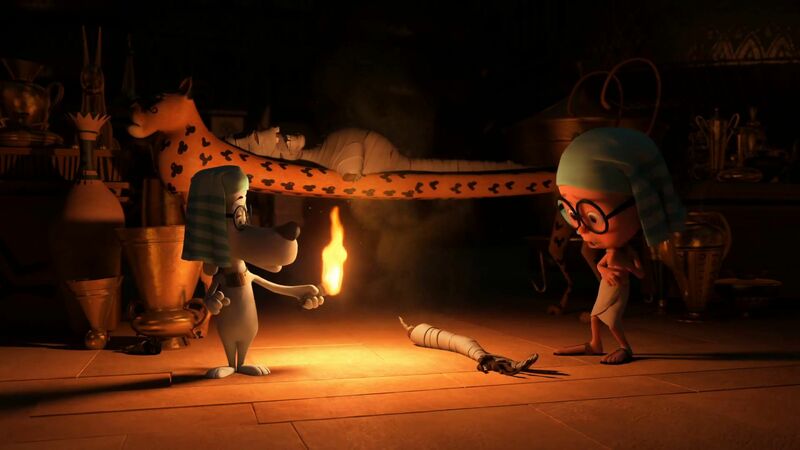 When their attempts to avoid a black hole ends with them back at the siege of Troy, Mr. Peabody is faced with Sherman’s determination to fight with Agamemnon (Warburton) and the rest of the Greek soldiers hidden within the Trojan Horse. Things escalate from there, and with Mrs Grunion planning to take Sherman into care at the same time as a rip in the space/time continuum threatens to destroy everything, can the pair patch things up in time to save the world? The good news is that, compared to Turbo, Mr. Peabody & Sherman is an absolute joy. There is so much to like about this movie. The relationship between Mr. Peabody and Sherman is played with obvious mutual affection, and Wright’s script tugs at the heartstrings on more than one occasion, highlighting the “deep respect” this odd parent and child have for each other. Burrell and Charles provide rich vocal performances, and while Robert Downey Jr was originally tipped to play Mr. Peabody, that interpretation may not have been the best idea because Burrell is terrific in a part that calls for him to relay more exposition than any other character in recent memory. Charles relays Sherman’s excitement and youthful insecurities with aplomb, and ends up almost stealing the show (although with Warburton in the cast, that’s nearly impossible). The story has fun with its depictions of the past, taking a range of liberties but always with a sense of fun, and there’s an inspired shot that shows how the Greeks get out of the Trojan Horse. Historical figures are held up to gentle mockery but again there’s an obvious affection, even for Robespierre. There are cameos from Albert Einstein (Brooks), George Washington, and with a great one-liner, Bill Clinton. Of the present day characters, Mrs Grunion is a fearsome villain in the manner of Miss Trunchbull from Matilda, Penny is a mix of school bully and (eventual) best friend, and her parents are a winning combination of ditzy and clueless. The script juggles everyone to good effect, and rarely puts a foot wrong. The movie is gorgeous to look at, the visuals popping off the screen – particularly in 3D – and the animation is packed with great sight gags and puns and there’s always something going on to overwhelm the attention. Minkoff keeps a sure hand on the tiller, making it look easy at times, and grounds the science fiction aspects through close attention to the relationship between Mr. Peabody and Sherman. The humour is infectious, and the general good-natured approach works tremendously, building up so much good will that by the movie’s end you’re prepared to forgive any missteps it might make on the way (there are a couple but they aren’t bad enough to hurt the movie or stop its momentum). Rating: 9/10 – an early contender for best animated movie of 2014, Mr. Peabody & Sherman is a light-hearted romp that hits the mark with recurring ease; a treat for children and adults alike.